There is a big difference between being born Jewish and choosing to be Jewish. Although born into Jewish families, some students were largely uninvolved with their religious identities until they found the Jewish community on this campus. One of them is sophomore computer science and finance major Noah Zbozny. Although he always knew he was Jewish growing up, he said he and his secular family didn’t practice religion regularly. “For my family, Judaism was just about going to shul on the High Holidays and not much else,” he said. 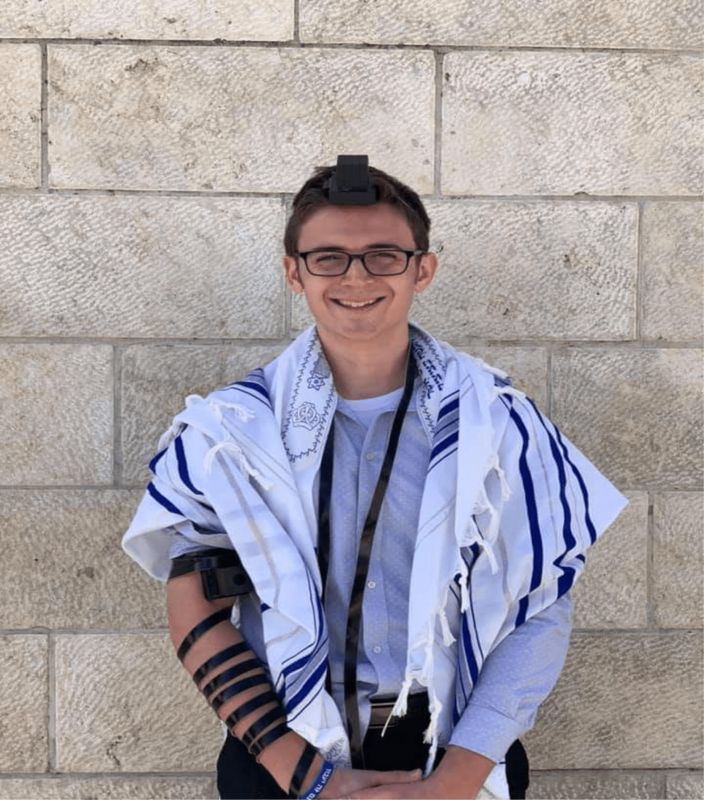 Noah Zbozny at the Kotel in Jerusalem during a January 2019 Birthright trip. Photo courtesy of Maya Guthman. Zbozny said his spiritual Bar Mitzvah ceremony triggered a “void” in his religiosity, which was later fulfilled through the Jewish community at this university. When he got to college, he joined Ometz, the Conservative Jewish community on campus, and began to spend time at Hillel. Now Zbozny is involved in many Jewish organizations, such as Kedma, Chabad and Meor. Dirk Holzman, a senior electrical engineering and vocal performance student, is also exploring a newfound passion for Judaism. Holzman, like Zbozny, said he was born Jewish but did not have much exposure to religion beyond a couple of holidays and knowledge of general Jewish culture until he began to get involved with Hillel during his junior year. “Now it (Judaism) has become an extremely important part of my life that has shaped who I am as an individual and leader,” he said. 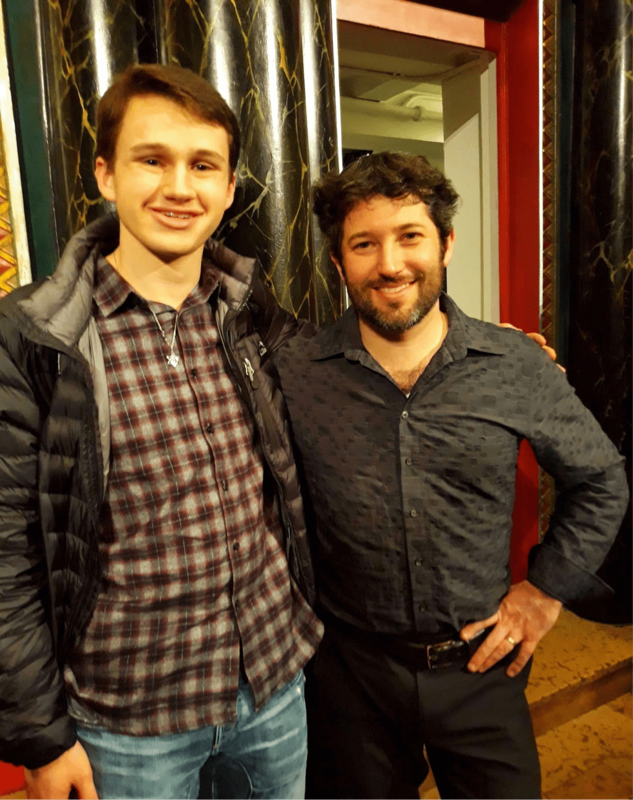 Dirk Holzman (left) at the conclusion of the Hadar Singing Communities Intensive with Joey Weisenberg in December 2018. Deborah Brown/Mitzpeh. Holzman is now the coordinator and song-leader of Ruach, the Reform Jewish community at this university, as well as the Ruach representative for the larger Hillel board. He encourages other Jewish students to share their experiences in the Terp Nigun Circle, a Jewish pluralistic group of music-sharing that he created. As a vocal performer, he said he uses his voice to convey his Jewish faith. Justin Hoch, a senior sociology major, was raised in a Reform household and is the grandson of a Holocaust survivor. Although he was exposed to Judaism from an early age, Hoch’s faith was mostly dormant until his Bar Mitzvah. “I didn’t really have much time for religion. Things were in the way, until my Bar Mitzvah,” he said. To prepare for his Bar Mitzvah, he learned about Judaism with a private tutor, and decided to become more involved with the culture. Justin Hoch in Jerusalem at the Kotel, July 2018. Photo courtesy of Justin Hoch. 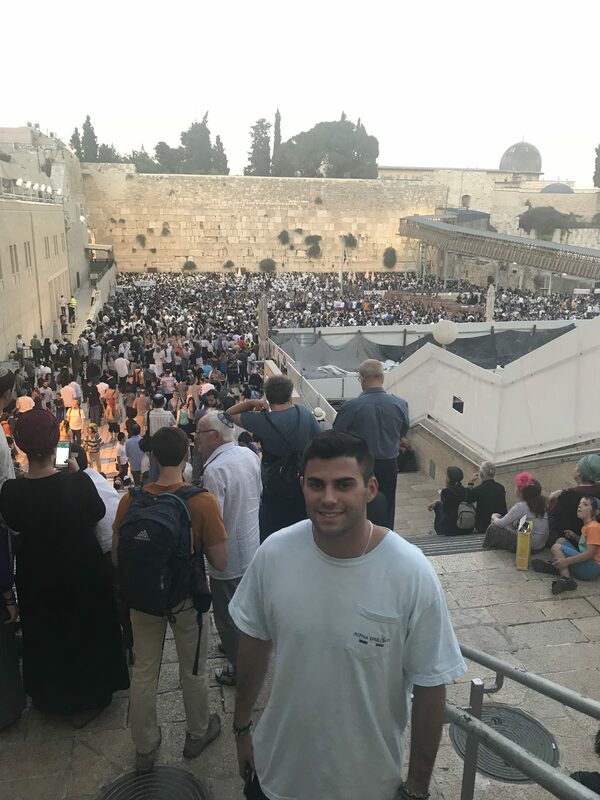 During a Birthright trip to Israel in summer 2018, Hoch learned more about his religion by connecting with Israeli Jews. He began to study Jewish texts and discover his religious side. “I felt something inside of me that I hadn’t felt before. It was almost like a spark. I started developing a new identity,” he said. After his trip, Hoch became involved with Meor on campus, and now serves on the executive board where he recruits students who want to learn about Judaism and helps them develop their religious identities. But cultivating faith has not always been easy. Families who are unfamiliar with Judaism struggled to comprehend sudden interests in religion at times. “At first it was a big conversation. Now we both have mutual respect, and while (my family) might not understand why I’m doing what I’m doing, they respect it,” Zbozny said. “It was hard for them to understand, just because they don’t have the same resources and knowledge like I do on campus,” Hoch said. Although Holzman’s family is now supportive of his religiosity, he has faced some challenges too. Holzman said he helped his family understand his religious choices by exposing them to different Jewish communities. As graduation approaches for some of these Terps, they plan to maintain and develop their Jewish identities in the broader world. Holzman is strongly considering attending cantorial school and becoming a professional cantor, but he said he needs to balance engineering with his passions for music and Judaism before making any decisions. Zbozny is considering joining the Modern Orthodox community but doesn’t have a set plan other than continuing to learn and practice his faith. “I’ll go wherever life takes me,” he said. Hoch said he plans to learn and grow by surrounding himself with people who share his mindset, raise a Jewish family and strive to become a better version of himself. No Replies to "From Jew-ish to Jew: How Jewish students connect to faith at UMD"